There are going to be those that don’t like Cloud Atlas. They may rage against the very concept and decry it as a failed attempt at bringing ADD theater to life. They may find fault with the initially disjointed narrative that focuses on six moments in time that don’t obviously lend themselves to one another. They may even pick at the often amazing but occasionally off-putting makeup featured heavily throughout the film. To those, I salute you and wish you well as you move along. I understand the criticisms of Cloud Atlas. This is certainly not a film for everyone. But for those that find merit in each of the six settings, and those that are willing to stretch their appreciation to accept a more esoteric theme, they will be rewarded with one of the better and more original films of the year. The story of Cloud Atlas is actually stories, six in total, all taken from the 2004 novel by David Mitchell. The six stories are told concurrently, with the film jumping back and forth as the narrative in each – although inherently unique – eventually finds a common thread to unite them. The stories are also connected in unlikely ways, as the central character of each new setting in some way stumbles upon a manuscript, a book, series of letters, or video of the chronologically previous character. The themes that tie these narratives together are not fully revealed until the end, and the influence one has upon the other is subtle, and not always obvious. It is there though. But regardless of the overall impact, each of the individual narratives offers a complete story. The film begins with an aged and tattooed Tom Hanks speaking a bizarre dialect that could only exist in the future, but chronologically the film begins in the South Pacific in 1849, with the story of an American notary named Thomas Ewing (Jim Sturgess) who is subjected to the horrors of slavery before beginning the journey home while racked with a debilitating illness. The next tale begins in the 1930s and focuses Robert Frobisher (Ben Whishaw), a young, gay musician who takes a job working with a marginalized, but brilliant composer. The next era highlighted is 1975, and focuses on a journalist (Halle Berry) who becomes involved in a deadly conspiracy after a chance encounter. From there the plot jumps to the present day plight of Timothy Cavendish (Jim Broadbent), a beleaguered publisher that finds himself running from one bizarre situation into a much weirder one. That leads to Neo Seoul and a dystopian future where a genetically engineered servant named Sonmi-451 (Doona Bae) is shown the truth about her society with violent results. The final tale takes place in a nearly unrecognizable Hawaii in the far future after an event alluded to only as The Fall reverts most of humanity back thousands of years. When a member of the last technological society on Earth comes to the island, she (Halle Berry) must put her trust in the hands of Zachary (Tom Hanks), an emotionally scarred tribesman. The gamble with Cloud Atlas is obvious. Each of those narratives is different in theme and tone, and each is an essential moving piece in a larger machine. If one fails, the whole is diminished. There may be enough to overcome a dislike of one or even two of the narratives, but even that seriously impacts the overall package. So all six pieces need to fit together and keep you entertained, otherwise the pacing will be severely affected. Thankfully, each of the stories is engaging and engrossing. The shift in tones – from the humor in Cavendish’s situation to the action of Neo Seoul to the detective yarn of the 70s – all fit together well, and the three directors, Lana and Andy Wachowski (the Matrix Trilogy, Speed Racer) and Tom Tykwer (Run Lola Run, The International) do a masterful job of knowing when to cut between times to maximize the emotional impact of each story. You are generally left wanting more, which is good, but you also build on the feeling the previous setting generated and let it influence your interpretation of the next period. This is well handled throughout, but nowhere more so than at the end when each of the six stories reaches its individual climax. The cuts between eras become fast and furious, and you are constantly left with mini-cliffhangers as the narrative picks up. Every one of the six then concludes with a surprisingly impactful ending, sometimes funny, sometimes tragic, but always relevant to the overall narrative. There are some that are stronger than others, and there is an order and a ranking to the power of each conclusion, but that will come down to the individual audience members tastes as much as anything. Of course, not all stories are created equal. Some certainly drag more than others, but there is a quality feel to each of them, and if you aren’t enjoying a particular section of one story just wait a few minutes. While the narratives began in radically different places, they are often held together by the cast that dons multiple hats. Most of the characters play more than one role, and a few are in four or more. 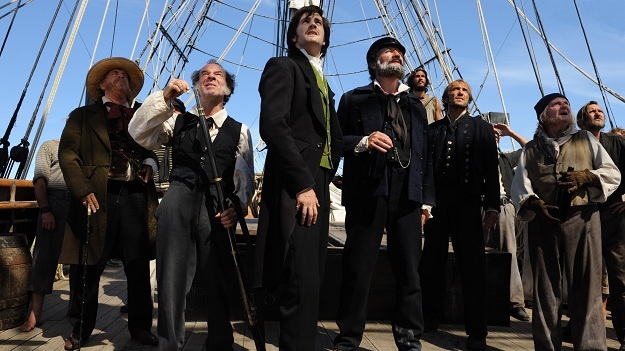 Hugo Weaving leads the pack with six roles, although Halle Berry and Jim Sturgess are the only actors with two roles that can both be considered as starring characters in their respective eras, with Berry leading the story in the 70s and costarring in the distant future, and Sturgess as the focal point of the 1849 piece and also co-starring in Neo Seoul. 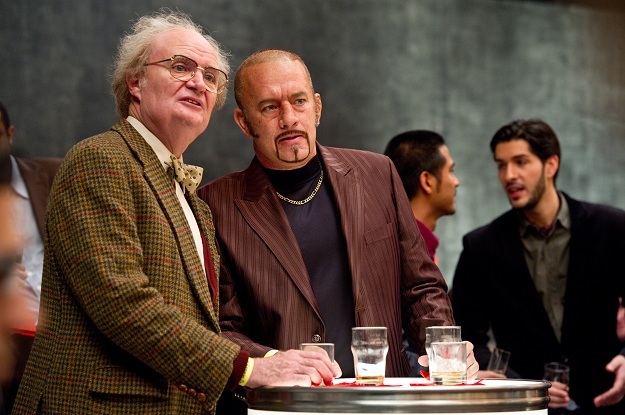 Some of the actors, Hanks and Broadbent especially, seem to gleefully embrace the chance to try out the different skins they wear, while others consume their new characters with a degree of intensity that impresses. Of all the stars in the film, Sturgess is perhaps the standout. In each of the roles he plays, he transforms into that character. His mannerisms change, his vocal patterns mutate, and he approaches each role from a different viewpoint. Perhaps he is favored by the story of the two major parts he plays, as both are motivated by love, but he embraces the story powerfully. Hanks is in top form as well, and whether cackling as the 19th century Dr. Goose, or battling inner demons in the future as Zachary, he brings a fire to the role. Berry by comparison also does a good job, but her roles are somewhat hampered in comparison, as they are far more traditional even as she plays a member of a scientifically advanced branch of humanity. Broadbent, however, may have the most endearing role in the film as Cavendish, a lovable loser with the timing of an oblivious Englishman, but it is Whishaw that has perhaps the most emotionally charged role. Between this and his turn as Q in the upcoming Bond film Skyfall, Whishaw may be bound for stardom. The actors are free to indulge in playing multiple roles thanks in part to the makeup and effects used. For the most part, they are exceptional. In crowded theaters, the end credits will become a game of sorts as audiences are shown the various roles each actor played. If you correctly guessed them all, you will be in the minority. Hugh Grant in particular is almost like an Easter Egg in this film thanks to his time in the makeup chair. There are a few moments where the makeup becomes disconcerting and obviously fake, but these moments are typically brief. The effects, although used sparingly, make this film possible. Moments like the first time you see Neo Seoul or the juxtaposed technology in the primitive future meld well with the generally remarkable look of the period pieces. 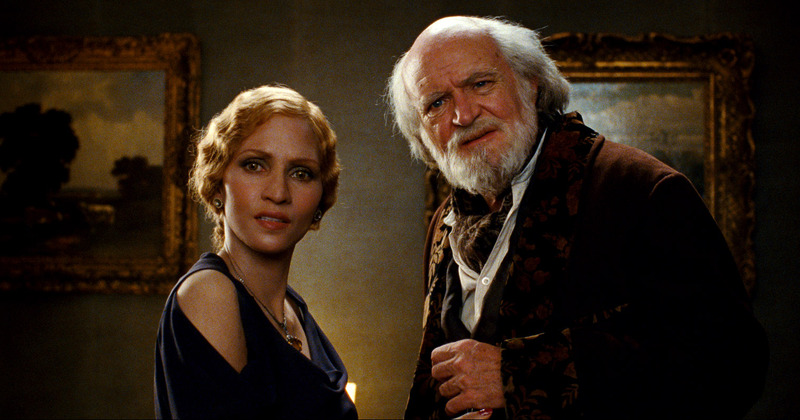 Despite the $100 million budget, Cloud Atlas is an indie film that just happens to star several major Hollywood talents. And like an indie movie, it stretches itself out and plays with the convention of film in order to try something new. On paper, it shouldn’t work. You have six different stories with one emotional thread that the audience is left to recognize and accept on their own. And yet somehow it all manages to come together. The pacing is spot on and the cuts between time periods are handled in such a way that they help to lead you into the next narrative even though it may be completely different in tone. There is no way this should work. And yet it does. 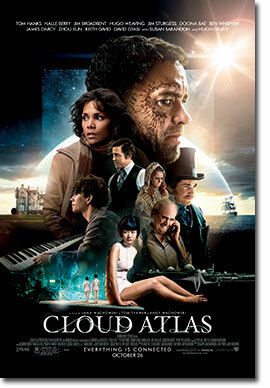 For those willing to accept the odd nature of the film, for those that can appreciate that a story can have depth even if there isn’t a lot of time to fully flesh out the characters, and for those looking for something that is fresh and original, Cloud Atlas comes highly recommended.